About a year ago, while teaching art history at Bradley University, I committed to giving a talk about the spiritual in modern and contemporary art. That talk is fast approaching, and has been leading me to think not only about artists who embrace a spiritual purpose for their art, but about where the spiritual is to be found in the act of viewing art. I am defining “spiritual” not as religious, but as the urge – often achieved through religious practice – to transcend self or the present moment, to connect with the universe in some larger way. Numerous artists write or speak about the relationship between their art and the spiritual (see, for example, Kandinsky, Newman, Abromovic). But to what extent is viewing art about connecting with something larger, something cosmic, something beyond the self? And what are the conditions that allow for this experience? There are very few resources out there that investigate this aspect of art viewing or museum going. The most useful may be Kiersten Latham’s article Numinous Experiences with Museum Objects. “Numinous” is a word borrowed from religious studies, and a numinous experience can be defined by deep engagement or transcendence, empathy, and awe or reverence. It might also be described as a state of wonder or resonance. While not all of the experiences Latham describes can be called “spiritual,” and only two of them involve experiences with art, her study is useful in that she captures and investigates transcendent experiences with objects. In TV shows … sometimes they do that camera trick where the person’s being, something’s being sucked towards … the camera. That’s kind of what you felt. I mean, I felt I was, like I was being drawn to [the painting]. Or drawn into it . . . as I’m looking backwards on it, I can see it [the painting] framed in the doorway and … everything else was dark, except for this painting. 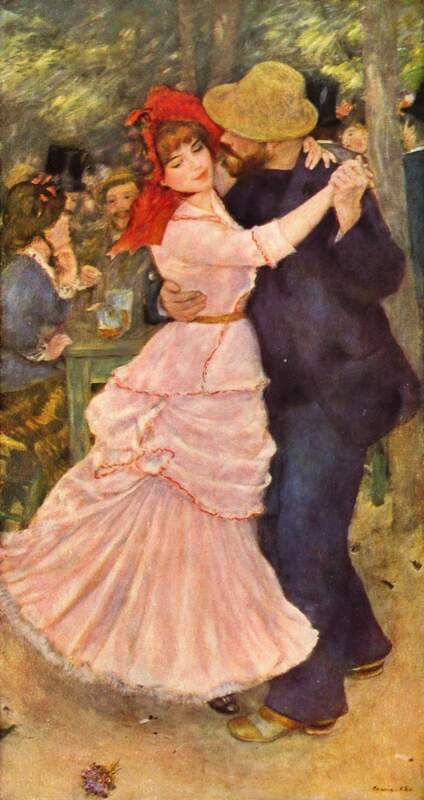 Pierre-Auguste Renoir, Dance at Bougival, 1883. This is one of over 40 works by Renoir in the collection of the MFA Boston. [It] may not have been the sculpture alone that so greatly impacted me. Other factors that likely played a role were the soaring gothic ceilings of a church that dates back to the 13th century, the elaborate and enormous stained glass windows, the the choral music…. But the experience … – that was all Michelangelo. 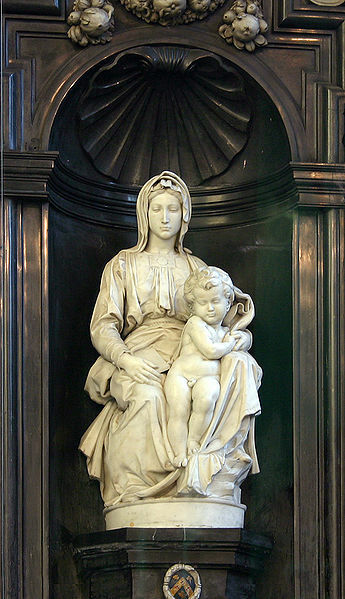 And the imaginative empathy I felt while picturing the artist chiseling out tenderness, affection, and serenity from a block of marble – that was all Michelangelo too. These described experiences focus on the relationship between the space and the work of art. (In the first example, the experience was marked by the disappearance of the space.) They suggest that museums support a spiritual encounter in a way that books or computer screens cannot. Further, they suggest the possibility that museums themselves create the potential for numinous experience with any object. I did find two additional areas of work that seem related to the connection between the spiritual and art viewing. They are related in that they examine the museum’s potential to impact the way one understands oneself in the context of the larger world, rather than to evoke a feeling or teach information. The first is the program Art-O-Mancy, a form of therapy through art viewing in which visitors view and consider a work of art with the intent of making sense of their own lives. The second is Jay Rounds’ article Doing Identity Work in Museums, which explores the ways in which museum visitors make use of exhibitions to better define and understand themselves. However, these approaches offer personal growth rather than spiritual transcendence. Do museum professionals value spiritual experiences with art? If so, how do we support the spiritual experience, alongside cognitive and emotional experiences? Are specific types of art more conducive to spiritual experiences? How do we promote this type of experience as a potential benefit of museum-going? What can museums do to encourage these experiences for visitors? These questions assume that (1) it is possible to have a spiritual (transcendent, transporting) experience with a work of art, (2) spiritual experiences with art are memorable and of personal importance for those who have them, and (3) spiritual experiences with art are due in part to the interaction between the work of art and the space in which they are housed. The topic of spirituality is uncomfortably fuzzy and new-age-ish. But it lingers because spiritual transcendence is a human urge. And it lingers in museums because they have the potential to serve as non-denominational temples, spaces for spiritual experience set apart from any particular religion. I would be very curious to hear from any museum professionals who have thought about how to foster or promote these experiences, and equally curious to hear from those who think this is outside of the purview of museum work, and can explain why. Hilla Rebay, the first director of the Guggenheim Museum, wrote to Frank Lloyd Wright asking him to build her a “Temple of Spirit.” Image credit: “Guggenheim New York” by Martyn Jones at en.wikipedia. Licensed under CC BY-SA 3.0 via Wikimedia Commons. ← Why do we need “classroom management” in museums? Rebecca, I think this is a really interesting and important topic! I agree that it can get uncomfortably fuzzy and slightly new agey, but the potential connection can be worth the risk. During an experience with a work of art, if it seems like the students are all really jazzed about what they see and they’re looking for the words to share their enthusiasm, I’ll ask: “How is this work of art magical?” Somehow, this question is the one that tips into transcendence just enough to become moving, but also remain grounded in reality. Magic can be silly (rabbit in a hat), or it can be something very serious (walking on water). The object, group conversation and tour goals would all be considered before I go somewhere like this, but it’s definitely one of my favorite experiences to share during tours. Dear Rebecca, thank you very much for this inspiring research. In my personal experience viewing art can be utterly profound, art can be a gateway to the transcendental… and I would personally love to see museums turn towards incarnating the enormous potential they have to facilitate art which offers a deep and life transforming experience, a true imprint on one’s being. I would love to see contemporary art make the leap into rediscovering the sacred in universal ways and forms never seen before… if you are interested in a more in-depth dialogue please feel free to get in touch. All the best to you….